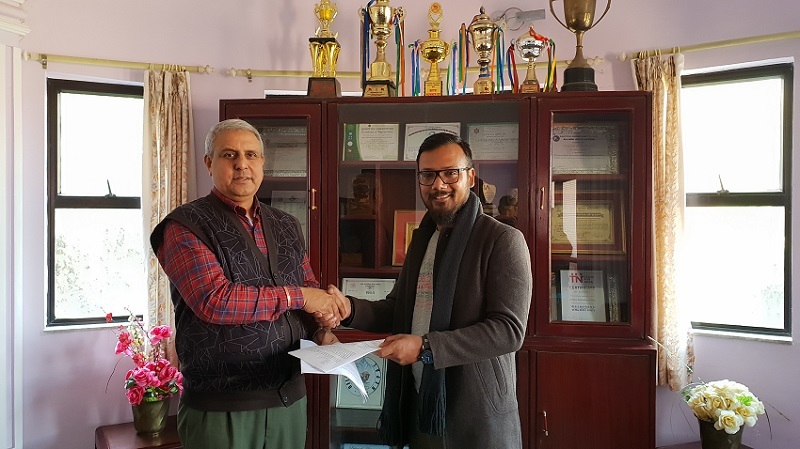 Kantipur Engineering college and Robotics Association of Nepal (RAN) has signed an MOU on 29th November, 2018. KEC has been associated with RAN for a long time for providing much needed highly talented and skilled engineers to meet mutual dream of technologically enhanced society. RAN is a non-profit, non-government organization that has been striving to provide excellent platform for students, researcher and tech enthusiast of Nepal in incubating, enhancing and fostering their tech related idea to materialize into a product. RAN particularly works in the field of robotics, unmanned aerial vehicle (UAV), Drone and automation in bringing global scale technology in local level by organizing various kinds of seminar, workshops, training and competition event in national and international level. On the occasion, Principal of Kantipur Enigneering College, Er. Rameshwar Rijal and President of RAN, Mr. Bikash Gurung signed the MOU that ensures the mutual cooperation and institutionalizes this relationship. Our students will be directly befitted from this relationship as they will be getting regular trainings, will be participating in workshops and competition that will be organized by RAN in coming days like Miss Tech and Yantra etc.